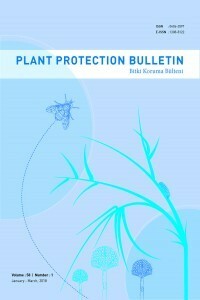 Plant Protection Bulletin has been published by Plant Protection Central Research Institute since 1952. The journal is published four times a year with original research articles in English or Turkish languages on plant protection and health. It includes research on biological, ecological, physiological, epidemiological, taxonomic studies and methods of protection in the field of disease, pest and weed and natural enemies that cause damage in plant and plant products. In addition, studies on residue, toxicology, and formulations of plant protection products and plant protection machinery are also included. Article evaluation process is based on double-blind reviewer system and published as open access. Annual biological studies, short communication, first report, and compilations do not publish in the journal.